In recent days everyone’s been talking about this family. But, you have to say, the father and son conduct themselves with the highest degree of modesty, politeness and tact when dealing with those around them. For example, with me they very politely, and even with regret, refused to talk about the World Championship. 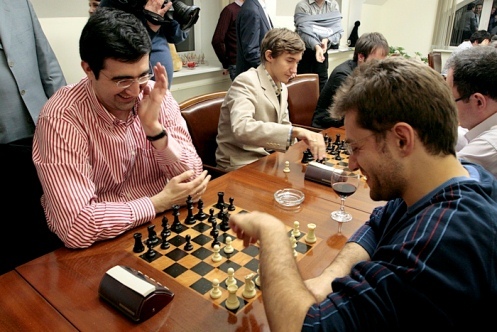 I’d even add: Henrik Carlsen asked his son with his eyes: “But maybe we could after all satisfy the curiosity of the Chess-News readers?” But Magnus was adamant. For now (I add). 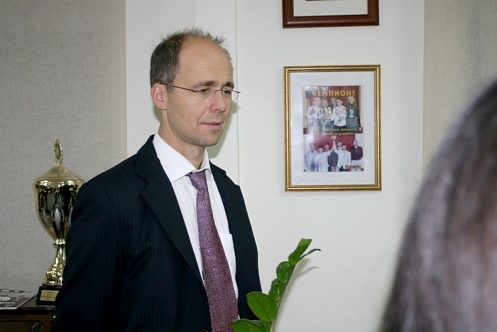 And so smoothly, with the help of Pavel Eljanov and Natalia Pogonina we switch from men to women. The Russian team and Generation Next: Francesca-Maria… I wanted to write “Kosteniuk”, but changed my mind in time. 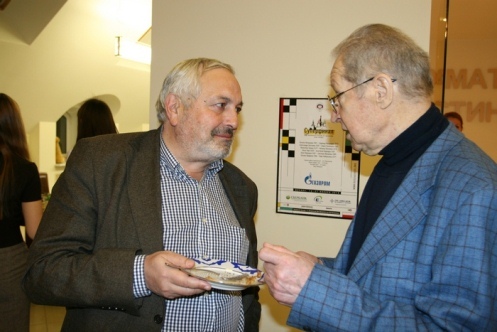 The journalist Vitaly Dymarsky and simply Yury Averbakh. 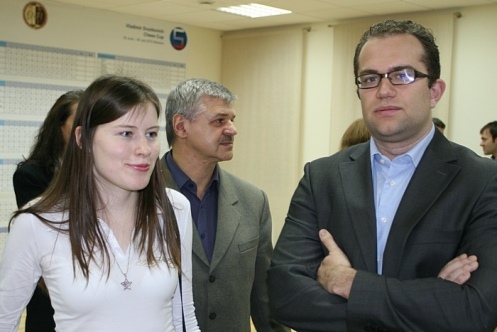 Levon Aronian catches the attention of all the girls. 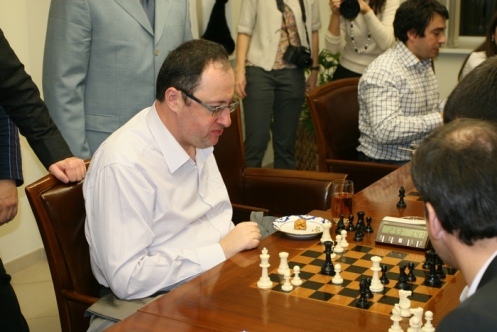 Boris Gelfand does everything with one hand (as the rules prescribe): he moves the pieces, presses the clock, and puts a pastry in his mouth. And then there was a tournament organised by VTB (it’s some sort of bank). 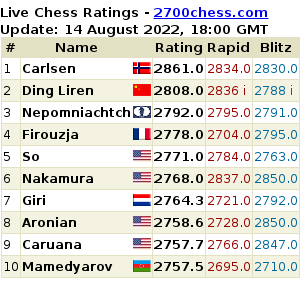 Four grandmasters and two amateurs. To be honest, I didn’t really look into the idea, but roughly: it’s to give a chance for a non-professional to get into the Blitz World Championship. Or something like that. In short, Kramnik and Aronian are still going into the draw for the first round. The final position. That’s how real men play. 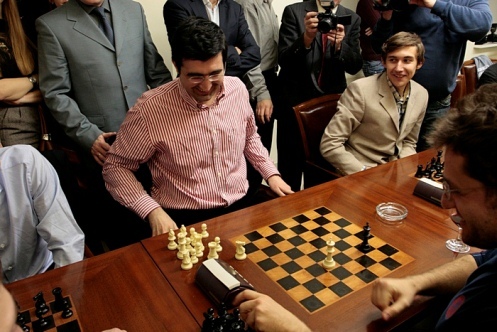 He also recorded a historic encounter between ex-World Champion Vladimir Kramnik and… a robot – as the current top-rated player Magnus Carlsen looks on. The robot has mastered even pressing the clock, and humanity’s prospects look bleak – though Kramnik showed there might still be some chances to fight back with the cunning move, a6.5. The pawn half-way between the two squares makes the robot freeze for a while, but then trying to shake hands to agree a draw might have turned out to be a serious blunder! In the end the human (still in one piece) claimed a draw, though the robot would no doubt have chosen to play on with its extra pawn until someone finally pulled the plug. Does anyone know what chess engine the robot was using? I’m not sure if it’s always the same, but Sergey Shipov mentioned on his forum that he played a whole match with the robot and it was running Rybka. Shipov did ok but said he only scored points by setting up fortresses (drawing with the 50-move rule) and by flagging the computer. He said they’ve speeded it up since – at one point in this video Kramnik jokes that the robot should be ashamed of itself for trying to win on time! 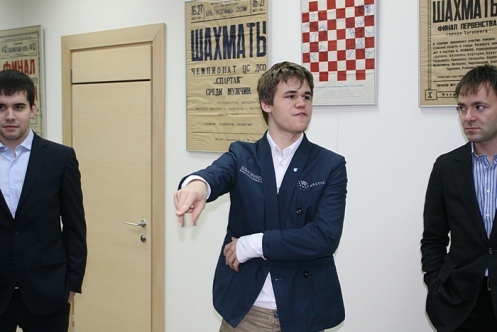 Shipov also said the robot’s creator had the idea of getting the robot to play the winner of the Blitz World Championship – so maybe we can look forward to Aronian v the Terminator! Well, now they absolutely NEED to make it into a form suitable for a 21st century replica-edition of the Turk!